Today is the last official day of finishing up pink. I hope you have lots of great blocks to share. I got some nine patches framed, a few postage stamp stars, and a couple of little twinklers on pink backgrounds. 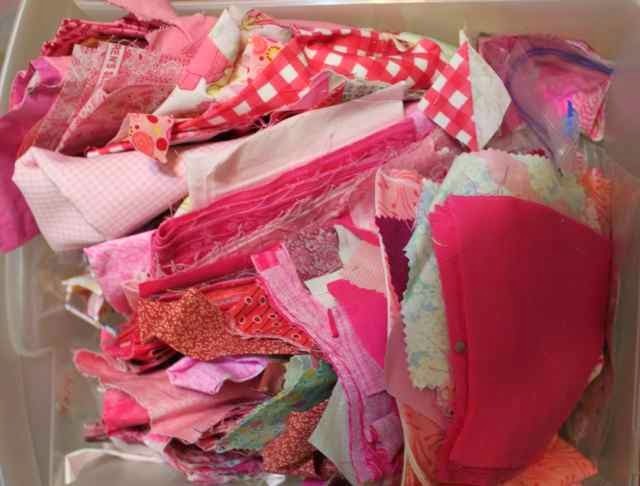 I also sorted through all the pink, and trimmed it into useable sizes. Last on my list are some string blocks. 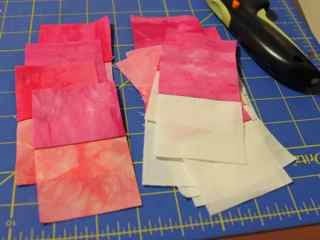 These little skinny strips are leftover after all the rest and will make great blocks with black centers in half dark and half light. There are already a few in the mix, but looks like a few more are on list for today. Now that Kurt is home again, he will do Lacrosse with Sydney while I do Mathcounts with Ryan and the school play with Anna. Tomorrow is completely open though, and sewing up these last pink strings will be a great project before pulling out the yellow for March. I found some time this evening to finally start to clean up the pink. Part of that, was cutting the squares for alternate blocks in the sampler quilt. 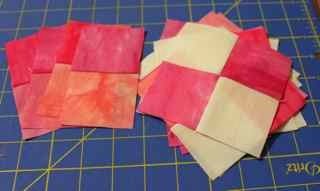 With whatever pink scraps you have left, you will need to cut 24 squares. They should each be 2.5 inches. You will also need 16 squares of background fabric. 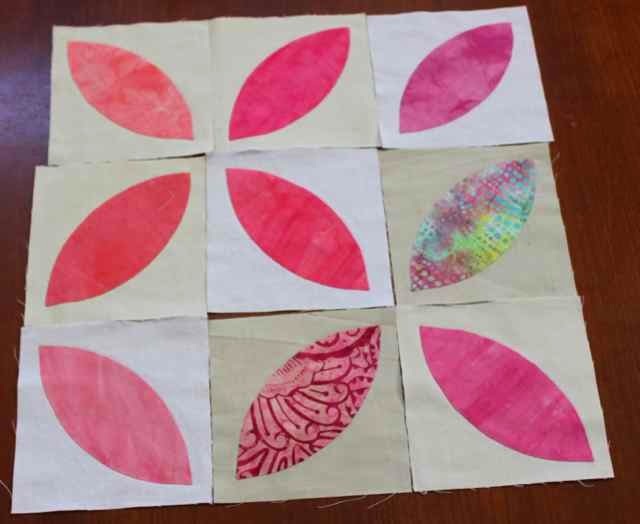 Combine 16 pink squares with 16 background squares and sew them into two patches. Press toward the pink. 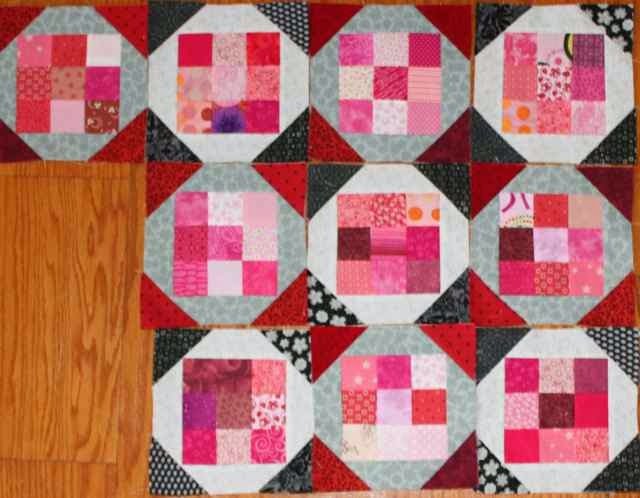 Combine the other 8 pinks together into four 2 patches. The 16 light and dark two patches should be combined into eight 4 patches while the pink and pink two patches will remain alone for now. I wonder what will happen to the extras from the postage stamp stars? Nine patches maybe? I also had enough 2.5 inch squares to make a couple more twinkle stars on pink, one light and one dark. 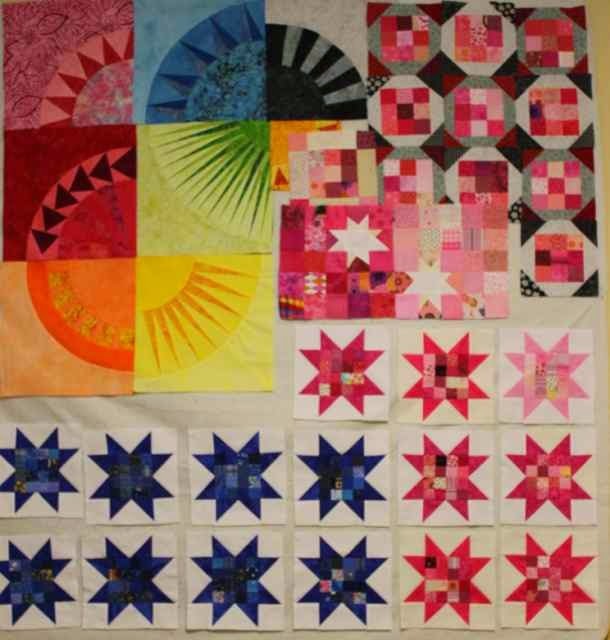 I'm not out of pink though, so I had better come up with a few more blocks to make before March brings a new color. I wonder what it will be? It is a sure sign that things are ready to slow down as my design wall begins to shift slowly from blue to pink. I had a chance this morning to finish up just a few postage stamp stars and pull out some framed nine patches. We had company over for dinner last night and so yesterday was spent on cleaning and cooking. It was very nice though, to wake up this morning to a nice tidy house and plenty of leftovers. There was nothing to keep me from heading straight to the machine for some much needed "ME" time. I have managed to sneak in just a bit of slow stitching time thanks to the prep work that got done over winter break. These nine orange peels will add nicely to the blues that I did last month for the begining of a beautiful slow stitched quilt. Having a little ready bag packed at all times makes it easy to grab and go when waiting is on the agenda. Be sure to go visit Kathy this morning to see what slow stitching is going on in blogland. 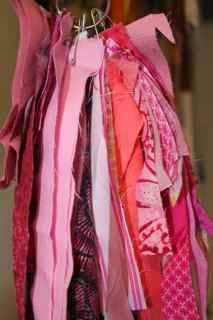 It is the 21st of February already and my pink scraps are woefully neglected. Hopefully soon I will be able to dig in and play. The only serious sewing I have done so far is 60 bags for the new PVC science fair boards. Not quite as much fun as quilt blocks. I have enjoyed seeing all of your pink projects though. So many pretty projects in progress. Use misterlinky below to share with us all. 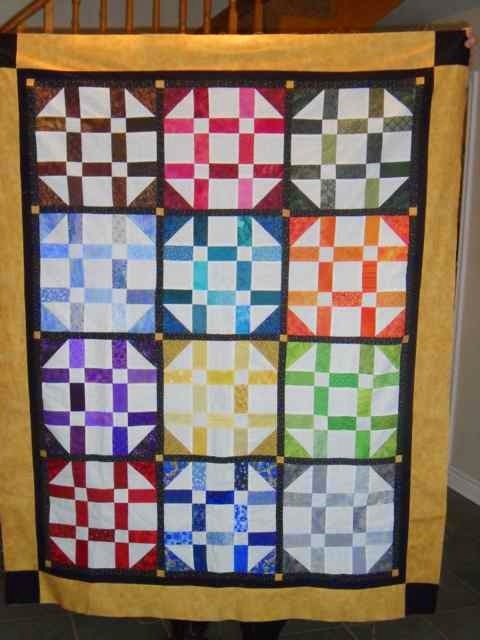 Anne from Ontario doesn't have a blog, but she sent some pictures of the quilts that she finished for the 2014 Rainbow Scrap Challenge. I love the up and down setting squares on these boat blocks, it really gives a great feeling of movement. I'm not sure of the name of this block, but it makes a nice secondary pattern where the blocks meet in the corners. 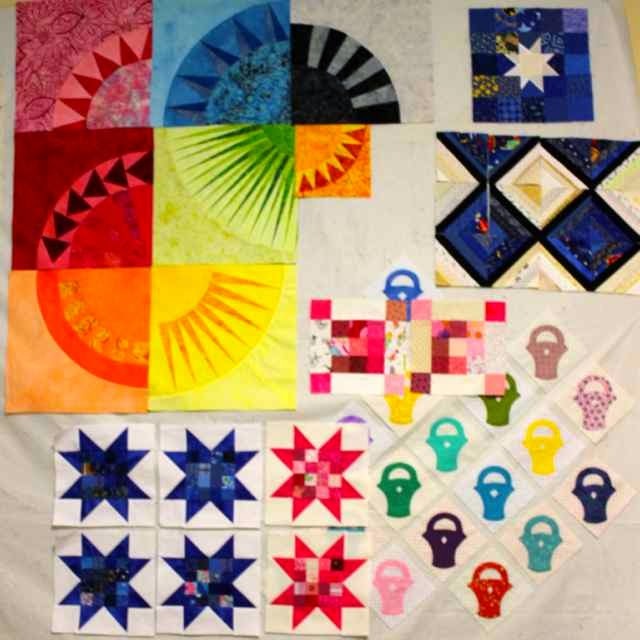 I'm so glad that Anne is joining in, even though she isn't able to blog about, I'm glad to be able to share her lovely rainbow quilts with you all. Fair weekend has come and gone. 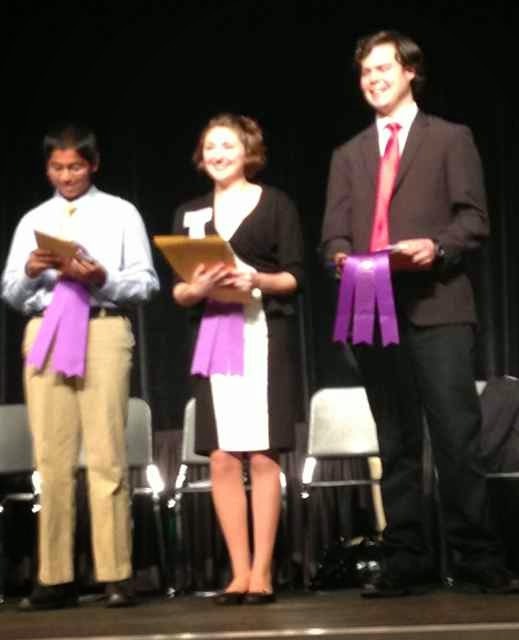 Many ribbons were awarded, along with scholarships and cash and assorted goodies. The best of show winners will be moving on to international in Pittsburg while the first place winners will move on to the state competition in Lakeland. 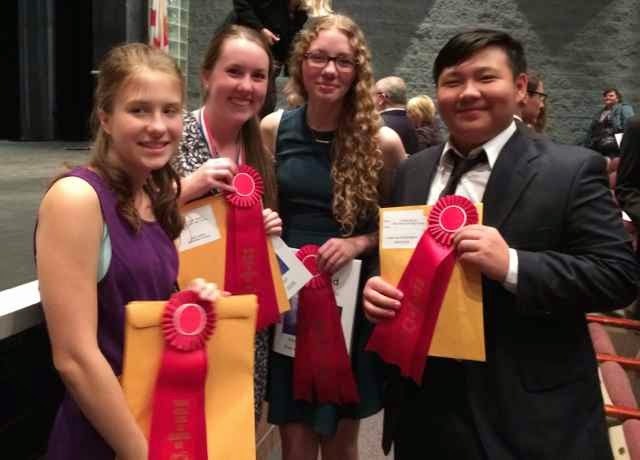 Anna's project won second in her category. The first place winner went on to best of show, though, so she felt good about her red ribbon. Here she is at her board. 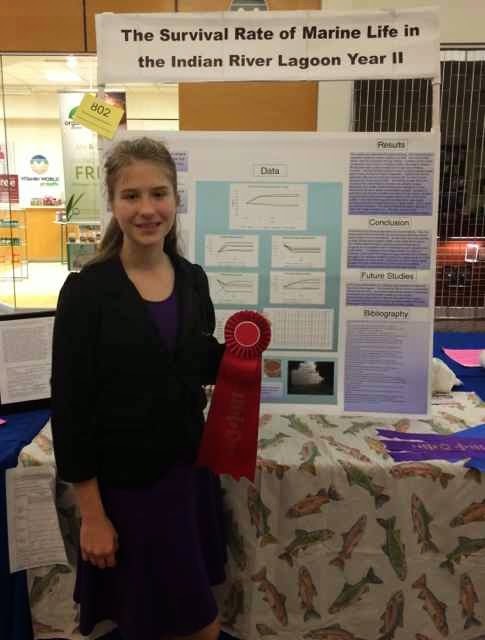 She continued on with her project from last year about water quality, but added brine shrimp to her oyster shells. 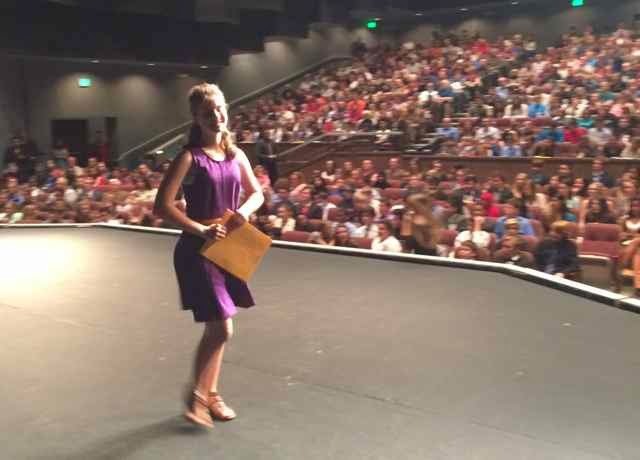 Despite missing out on a state bid, she has been invited to compete in 4 other follow up contests. She is most excited about one called I-SWEEEP which takes place Houston in May. 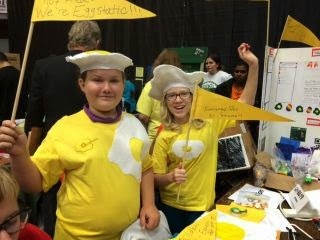 It is an international environmental science fair and she has already started chatting with some other participants from Sweden. 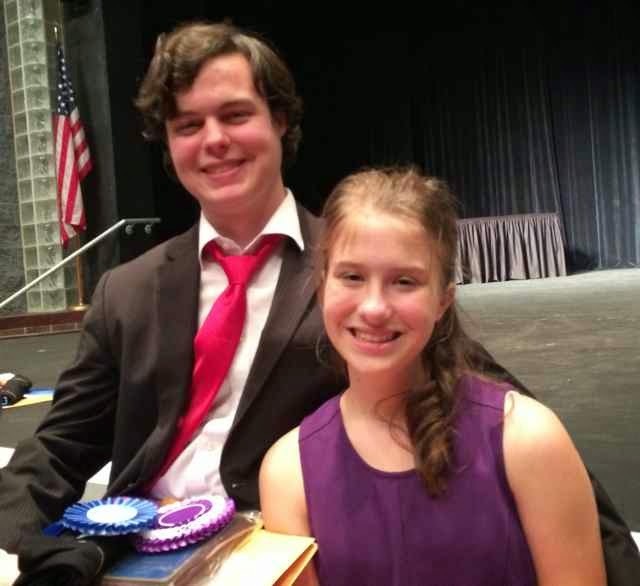 Here are Anna and River after the awards. They have been spending quite a bit of time together since Science Olympiad last month. So, as you can see, there hasn't been much sewing time as of late. I keep thinking that things will slow down soon, but I am constantly surprised as new things pop up. Nothing new for me on the pink front this week, so I pulled out this block from earlier. Winter break maybe? Science Fair is in FULL swing, and has us all running full speed ahead. I walked 20,000 steps today, a new record for me! Sunday promises some quiet time though, and I hope to visit your posts then. For now, please enjoy each other's posts on this holiday weekend. I'm not really sure what this block is called. I was thinking of it as a Bear's Paw while I sewed it, but as I sat down to write the tutorial, I realized a bear's paw would have a background square in the corner and I used a HST triangle block instead. I'm sure it has a name, but I'm not coming up with it right now. Does anyone else know? Anyway, it is a nice simple block to put together. 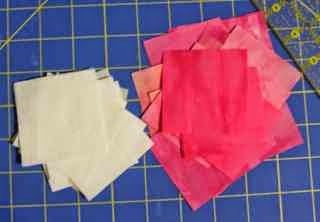 You will need a 4.5 inch square of pink along with 2.5 inch strips of pink and background. 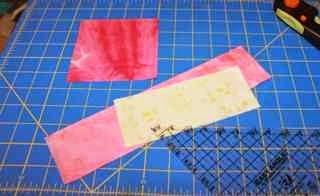 Place the pink and background fabrics right sides together and use the easy angle ruler to cut 5 triangles. Here are your pieces, ready to sew. 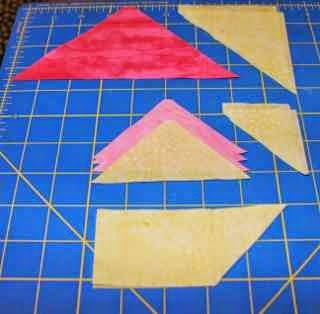 Sew the HST units together along the hypotenuse, press toward the pink and trim dog ears. 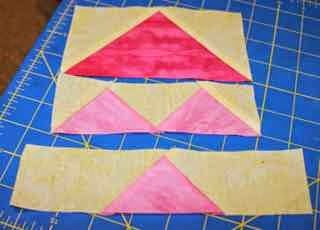 Arrange them around the pink square forming a top and a right edge as seen in the picture above. 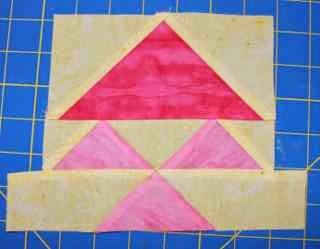 Sew two triangles to the right edge of the large pink square, press toward the square. Finally, sew the row of three HST units to the top of the square. Your block should be 6.5 inches unfinished. 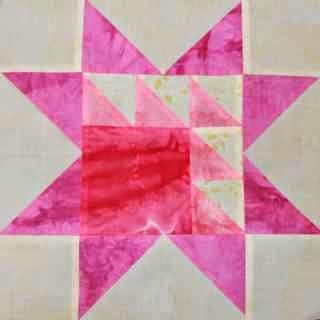 Insert the sampler block into the center of a sawtooth star following the tutorial seen here. I was amazed when I checked the comments on the February Fabric Giveaway to see 95 people had entered to win the hand dyed fabric by Vicki Welsh. WOW! 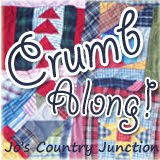 I really am tickled pink to have so many great quilters all joining in to the scrappy fun. Thanks to random.org, the lucky winner this month was chosen to be Kathy E. who blogs at Sparkles and Sprinkles. 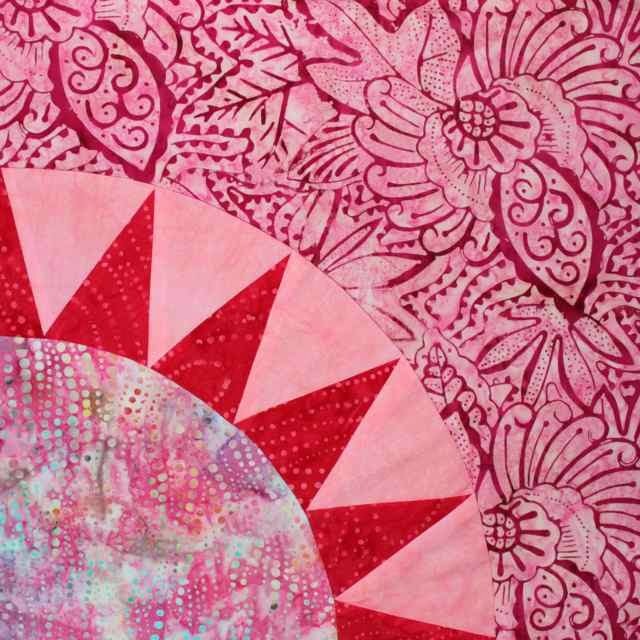 So Kathy, if you will kindly send me your snail mail via email, I will get your pink fabric off in the mail so that you can use it to create some beautiful projects during the month of February devoted to the color pink. I worked a little bit ahead on my pinks, which was fortunate given the schedule lately full of science fair and robotics. These pink framed nine patches will add nicely to the blues from last month. This weekend should be the calm before the storm, so hopefully I can play a bit more with my pink scraps before true peak of frenzy. How are all of your pink projects so far? Use the linkytool below to share your pink progress. Paula doesn't have a blog, but she has started following me through Pinterest and has joined into the Rainbow Scrap Challenge. 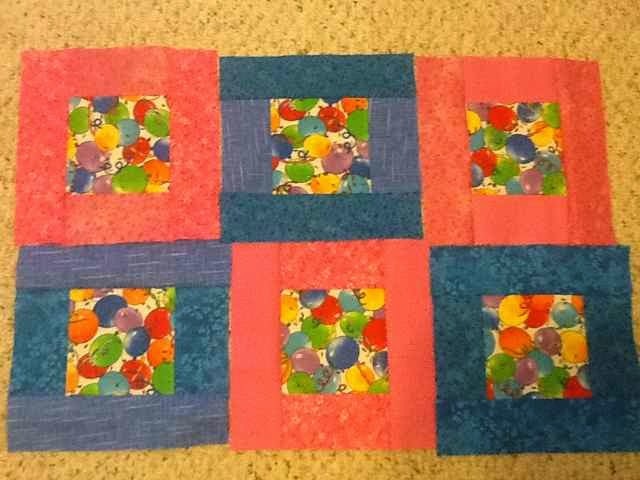 She was kind enough to send me this photo of her January and February blocks, which use the colors of the month to frame out some really adorable balloon fabric. 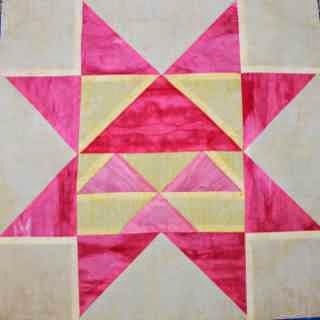 She has started a board called My Quilts, to share her progress. Way to go Paula! You are off to a great start. I had a little bit of time on Saturday to whip up these blue string blocks. Kurt was nice enough to take Ryan to FAMAT so that I could stay home. These are 4.5 inch blocks with a 1.25 inch black strip in the center. I really like the contrast that the black adds. It will look great with the pink scraps this month. Best of all, it is now time to put away the blue and pull out the new color! I made quite a large dent in the scraps, though there are still a few odds and ends to save for later. 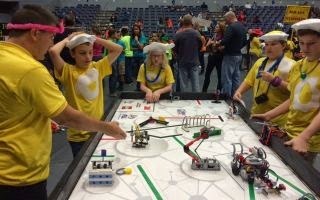 It was great to enjoy a little bit of down time on Saturday, because Sunday was all about the Regional Tournament for Legos. We had one sick team member, and had to scramble things around a bit, but it was quite a fun day anyway. 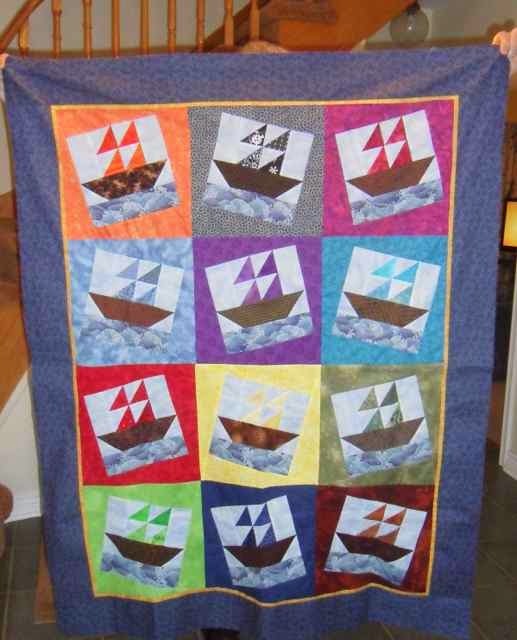 I have a Pinterest board of quilt blocks to try, and found this one pinned to it. Though I followed the link back, there was not a tutorial to go with it. Most of the pieces for this block are pretty straight forward. Flying geese can easily be cut using the companion angle for the goose part and the easy angle to make the background. Because this block has two sized of geese, it needs two sized of strips. 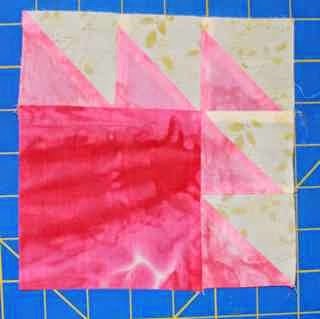 From the darker pink, use a 3.5 inch strip to cut one dark triangle with the companion angle ruler. From the background, use a 3.5 inch strip to cut 2 background triangles using the easy angle ruler. 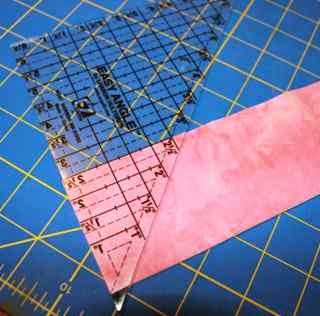 From the lighter pink, use a 2 inch strip to cut 2 triangles with the companion angle ruler. 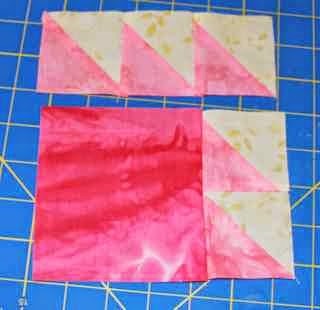 From the same strip of background fabric, cut one triangle using the companion angle ruler. The only problem was the wings on the bottom are rectangular to fill in the extra blank space. After much consideration, I decided to go with the "make it bigger and trim it down later" school of thought. 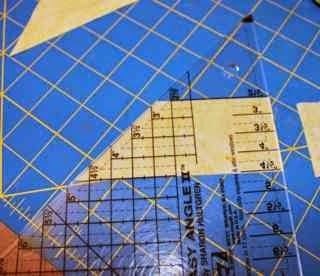 So with the easy angle ruler, I slid the fabric down to the 4.5 inch line and used the upright portion of the ruler to cut 2 longer background sections. It ended up being a bit of overkill, but it worked just fine in the end. 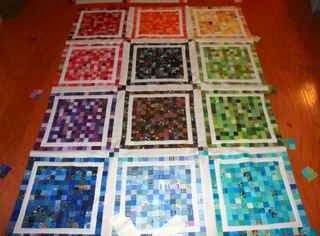 This block gets pieced in three rows. 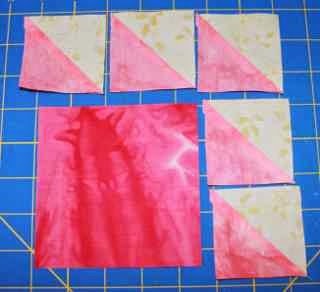 For row 1, sew a background triangle to each side of the dark pink goose. Press seams away from the pink. For row 2, sew the three geese together with the background goose in the middle. Alternate the blocks up and down. 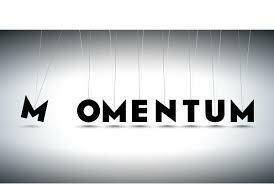 Add a background triangle to either side. 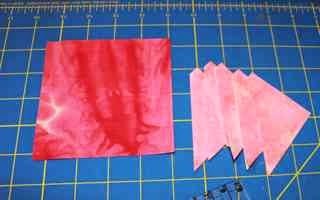 For row 3, sew one of the longer background pieces to either side of a single goose. Sew the three rows together, making sure to match the center of the bottom goose up with the center of the row above. There is extra fabric hanging off of either end, just trim it off after the block is sewn and pressed. Your 6.5 inch unfinished block will now serve as the center of a sawtooth star block. Sew the star points with the tutorial found here.